Our Art sizes are illustrated below using a standard two division couch for reference and scale. 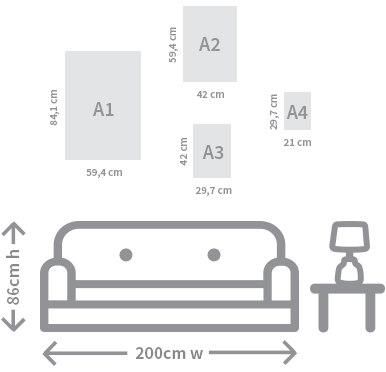 A standard two division couch is 200 cm wide. Please note that Superbalist sizes are designed to correlate with the standard size chart for all paper, print, & artworks. Please see the chart below for comparison. Cat Coquillette initially founded CatCoq, her illustration and design brand in Kansas City, but she’s now based in Thailand as a location-independent artist. Her work is renowned for its blend of bright colours and typography, with hand-painted brushwork and clean vector illustrations, whether it’s digital, watercolour or ink-based. As an experienced brand designer, she utilises her unique perspective to inform her works.